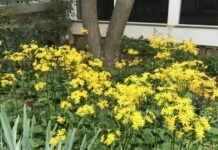 And I have not posted one of these for years, so, as a reminder: on the 15th of every month, garden bloggers post what is in flower in their gardens. The tradition was started by Carol of May Dreams Gardens. 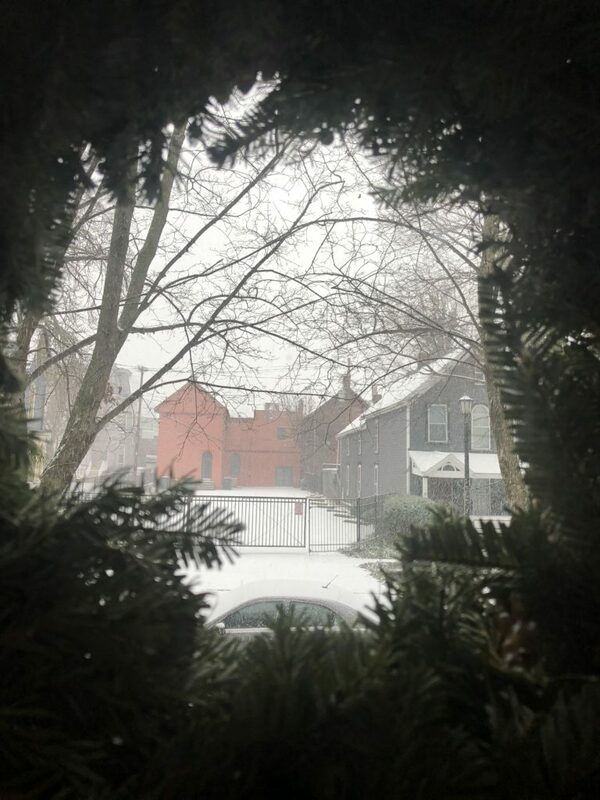 Normally I would never select January 15 as the day to jump back into the Garden Bloggers’ Bloom Day game, as what I have in January is pretty much like the above. 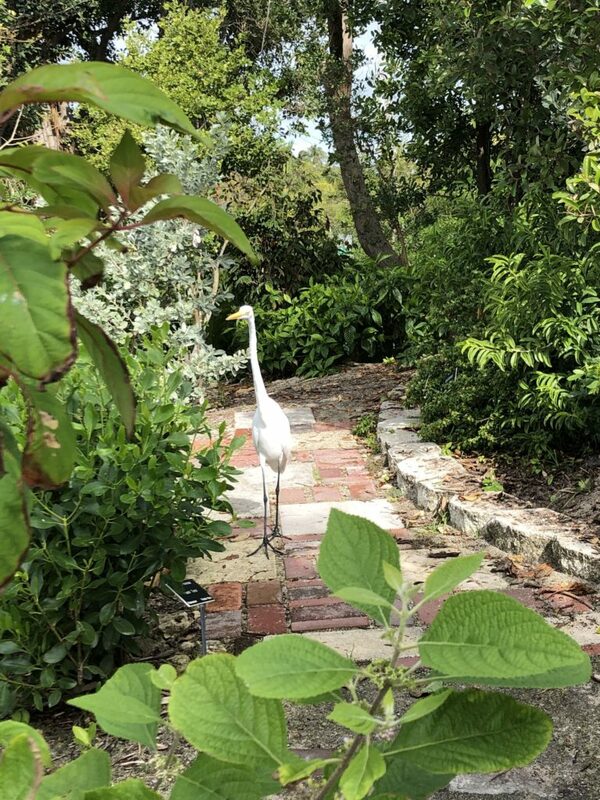 However, I’m in Key West at the moment, so I am appropriating its plants for my GBBD post. 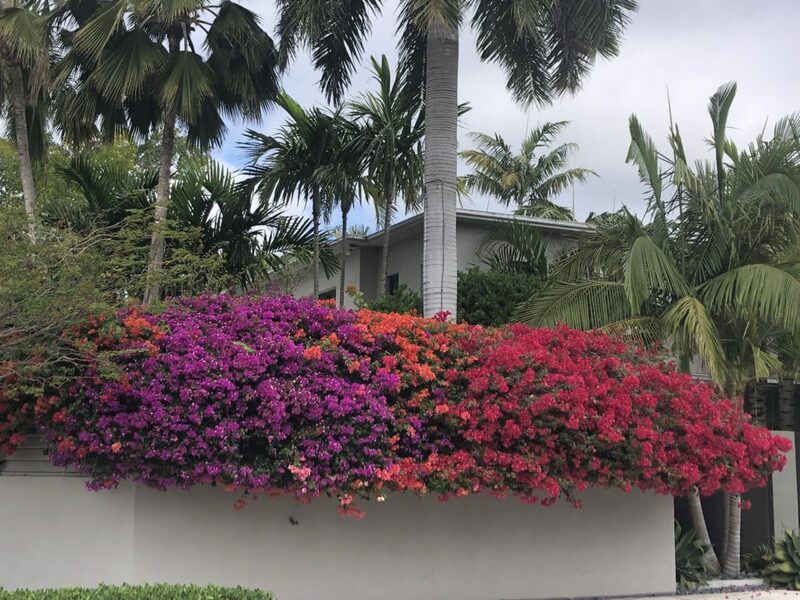 I know some of these: bougainvillea, croton, colocasia, what looks like huge poinsettias, and other lovely items. 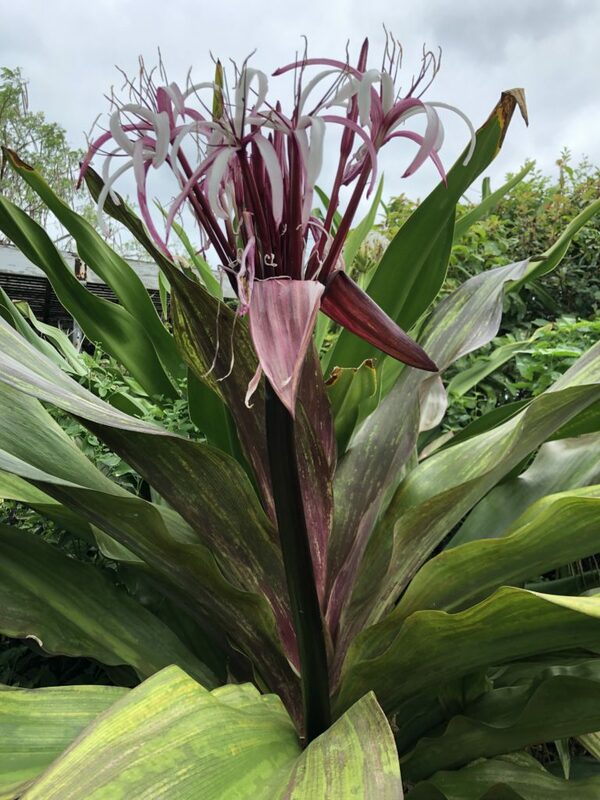 One of them, this crinum (below), is my favorite; it is found in the charming Martello West botanical garden, located in the remains of a fortification. Do I wish I was always in this “paradise.” No. It’s lovely for a week, but I’ll take my four seasons, including the snowy one. 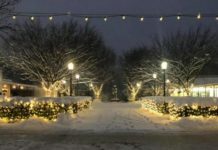 Gardeners are not exempt from weather snark, but, unlike many, gardeners understand the advantages cold seasons bring, like the possibilities of plants that can only be grown where there is a period of cold weather, like peonies, many spring bulbs, many lilacs, and (I believe) some fruit trees. I would likely be bored by the tropical glories of KW after a while, though it makes for a great winter respite. When I get an instant snarky comment when I reveal where I live to a taxi driver or other chance-met person, I figure he or she can’t be a gardener. 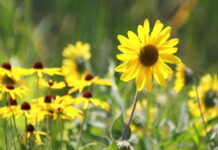 Gardeners understand that every zone has its botanical compensations. Gorgeous photos! 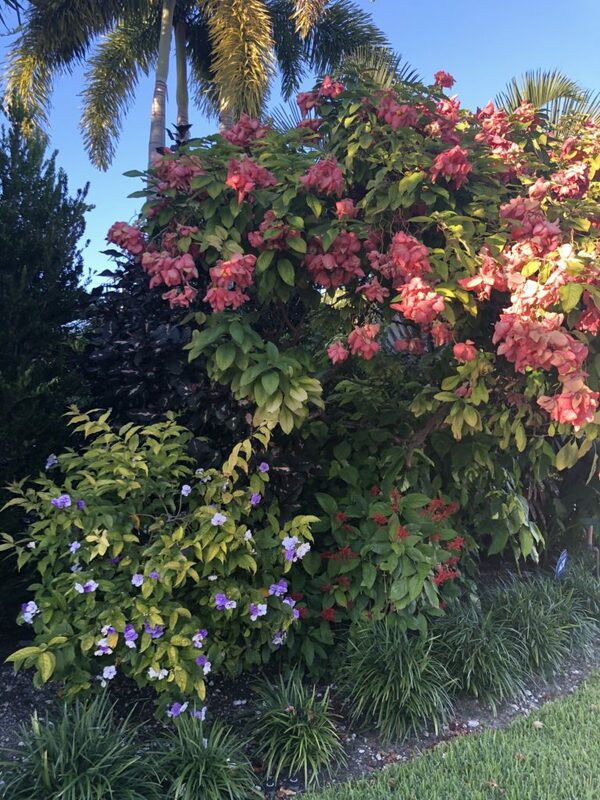 I see a Crinum, Brunfelsia and Mussienda. Hi Elizabeth- here in Central Florida we actually do have seasons, albeit more subtle than up north. The last pic is Yesterday, Today and Tomorrow/ Brunfelsia pauciflora. The flowers started out purple and gradually fade to lavender and then white period the front also has delightfully fragrant flowers. The exotic pink bush is Mussaenda Erythrophylla, Which is native to Africa and Asia. Commonly known as tropical dogwood, there are more than 150 varieties including a small group of hybrids named after the First Ladies of the Philippines. I recently was in Costa Rica where Mussaendas thrive.